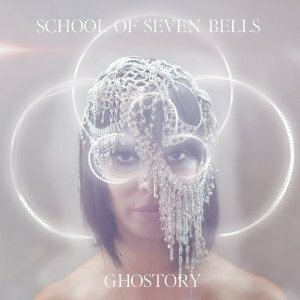 Though School of Seven Bells‘ critics may term the band’s moody aesthetic as impersonal or colorless, the New York-based band shuts the nonbelievers up with its third album Ghostory. While I wouldn’t use the dreaded “C” word and label it a “concept album,” Ghostory does stand in stark contrast to the SVIIB’s previous albums, Alpinisms and Disconnect from Desire as one central theme is present throughout: the introspective examination of the human element of relationships. The duo of Alejandra Deheza and Benjamin Curtis continue to push their creative relationship into new territory with the songwriting and production of Ghostory. Exploring the complexities of the most intimate human interactions in a comprehensible way seems like an impossible feat destined to fail while being plauged with ambiguity, but something in the pair’s dynamic during the songwriting phase solidified this lofty idea into something concrete and approachable while making the album flawlessly cohesive. Every song on Ghostory feels as though Deheza and Curtis wrote them effortlessly from life experiences and the lyrics flow from a very real place as though the album were a kiss off to those who’ve burned bridges with the duo. Ghostory bounds between danceable uptempo bass-heavy tracks like “Low Times” and the biographical track “Lafaye” then downshifts to the love scorned “Love Play” and the deeply affective “Reappear.” Deheza’s vocals are not singsongy nor particularly melodic, but are rather disjointed in delivery and breathy in quality. The keyboard melodies and lyrics make “Scavenger” a particular standout track and the bass and synth rhythms, reminiscent of Joy Division‘s “She’s Lost Control” only add to my personal affinity for the song. Ghostory is a solid example of how an amorphous theme can be harnessed to yield relatable tracks, each distinct from the other but all wrapped together in one cohesive little package. Dare I say that SVIIB has my favorite album of 2012 so far? Yes. I said it.